Wonderful presentation in Kelowna. I hope I’m still alive when the day comes that all education involves this kind of stimulating, invigorating approach. Very much enjoyed the whole evening and coincidentally a few days ago on the Documentary channel saw a few minutes of the maker of the film. Another gentleman by the name of Lee Gass who is a sculptor of much fame was in town for a talk and a show of his work and he also has a similar way of engaging with the audience, so we were doubly blessed and all in a few weeks. Yes we can and should make major changes in our education system and Norman Cornett is a shining example of how it can be done. A few years ago at our local college we had maybe five to ten profs from around Canada for a day event on their thoughts and new methods of teaching. Control by a few in our world goes on and only we can change that so education and action is very much needed. So thanks very much again. Do let us know of your writings and if you are contemplating an autobiography. I am not at all surprised that McGill, being a traditional college, with great support for the history of itself, and what it is teaching, and how, was alarmed, and threatened by the student’s positive response. I am surprised they allowed it to go on for 10 years. Most people who try a different way, : Christ, Gallileo, Pope John Paul, support for gay marriage, women’s rights, laws against abuse of women,children and dogs — are thought to be crazy, and bad. Fortunately, if you are lucky, the punishments don’t work. Repression of information and alternative thinking and doing are no so easily buried. They can and did make you go away, but the concept arises like the Phoenix from the ashes. It might help if you are able to let go of the rope in the tug of war, and go on without the bag of rocks you carry. If you stand up, you do make a bigger target. Teaching the way art, at it’s best is taught, is a great way to learn! 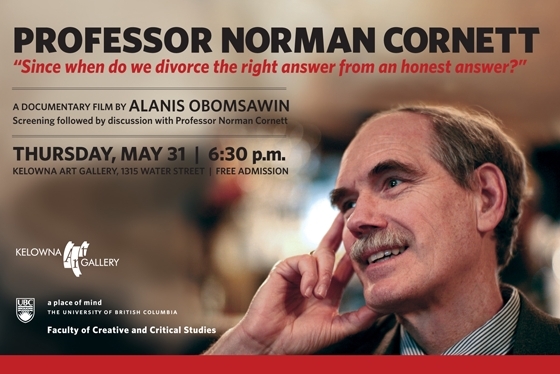 I can only say that I was disappointed in McGill’s treatment of Professor Cornett and his very stimulating and challenging approach to learning at the university level. My opinion of U Gill as an advanced and superior university has been diminished since it would seem to prefer the usual approach over the probing and exploratory treatment used by Prof. Cornett—and the popularity of his approach was underscored by the enthusiasm of those who were lucky enough to have experienced it. I would love to have been among the latter. U Gill is far the poorer for his dismissal. I wish Prof. Cornett the very best in his reincarnation as an educator.